Ferns appear to be such simple plants because of their lack of flowers. However I find their textures and subtle frond shapes endlessly attractive. A Broad buckler fern and a Borrer’s scaly male fern were pressed into clay and used to make a mould. 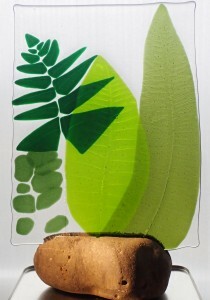 The use of the glass allows the texture of the fronds and their spore cases to be superimposed on their shapes and colours. Polypody ferns grow on walls and rocks in Northumberland. They are particularly common on Holy Island. In the winter they are still green, and the undersides are covered with clusters of spore producing structures that ripen from yellow ovals , through orange to rusty brown stripes. 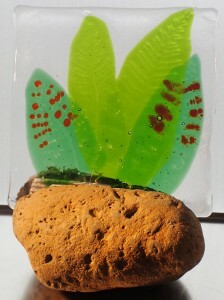 It seems apt to display the piece in a Northumbrian rock. 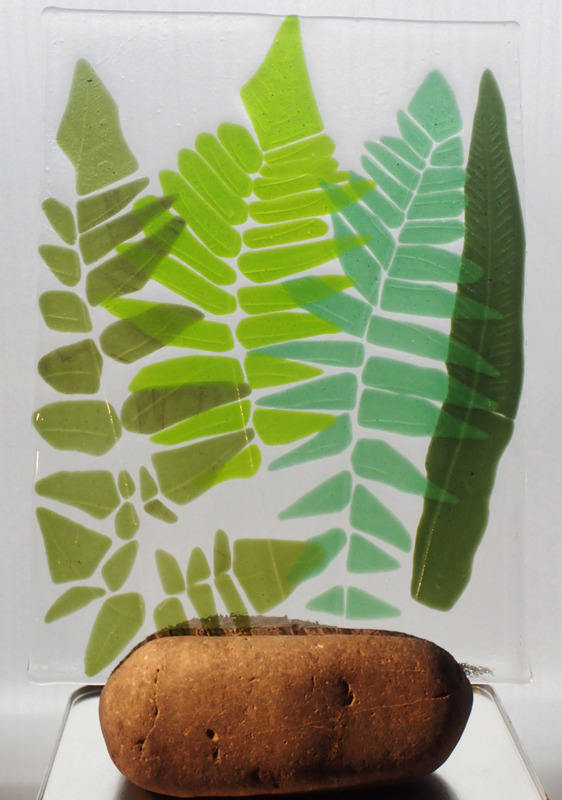 Ferns have great textures to use in the mould making process. Here I have used a Male Fern, Narrow Buckler Fern, Scaly Male Fern and Harts Tongue Fern from the verges of lanes near Felton, Northumberland . Displaying in a Northumbrian rock allows lighting from behind to emphasise the textures. Ferns have great textures to use in the mould making process. 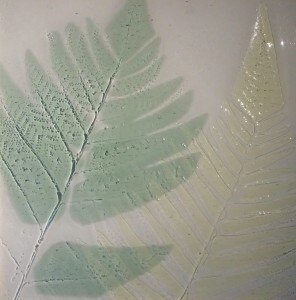 Here I have used a Soft Shield Fern, Scaly Male Fern and Narrow Buckler Fern from the verges of lanes near Felton, Northumberland and Maidenhair Fern from a garden. Displaying in a Northumbrian rock allows lighting from behind to emphasise the textures.